Google says: “Hasta la vista, baby” ! 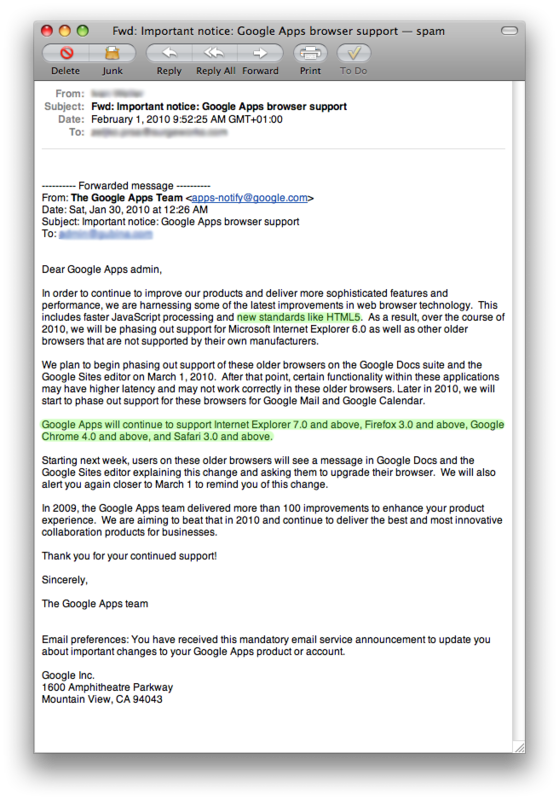 It means that google has oficialy joined the IE6 shut-down campaign that’s been raging all over the net since ever now. The web has evolved in the last ten years, from simple text pages to rich, interactive applications including video and voice. Unfortunately, very old browsers cannot run many of these new features effectively. So to help ensure your business can use the latest, most advanced web apps, we encourage you to update your browsers as soon as possible. This really is great news, while I have tried hard to ensure IE6 compatibility it will be a big help to just start coding without hacks and have a nice clean website. “IE6 shut-down campaign” — this sounds realy good!!! I think its better without IE 6.